You know how I love modern design around here. Well, one of my daughters reminded me that modern isn’t everyone’s thing and I should share some ideas that had a more vintage feel. With Mother’s Day so close, I have rounded up 15 Cute Ways to Repurpose Vintage Linens. I’m always drawn to vintage linens but never really know what to do with them. As a matter of fact, I have a whole bunch from my Mom and a few from a friend. These ideas have really got me thinking. I am especially drawn to #9 down the list. A valance from vintage hankies. This would be perfect if you have lots of vintage hankies of similar sizes. This moth made from vintage linens is exquisite. More curtain inspiration, but a patchwork one this time. I really love how she took the time to piece these together. Perfect for a cottage look. Ya’ know I love aprons and here’s a tutorial for a layered linen apron. 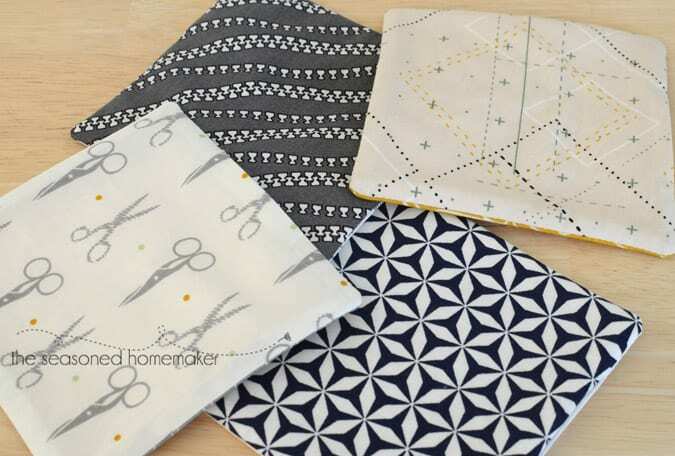 A free pattern download for sewing small envelope pouches from vintage linens. You’ll need to enter your email to access the free pattern. No tutorial but a few pictures for inspiration on using vintage linens for buttons. 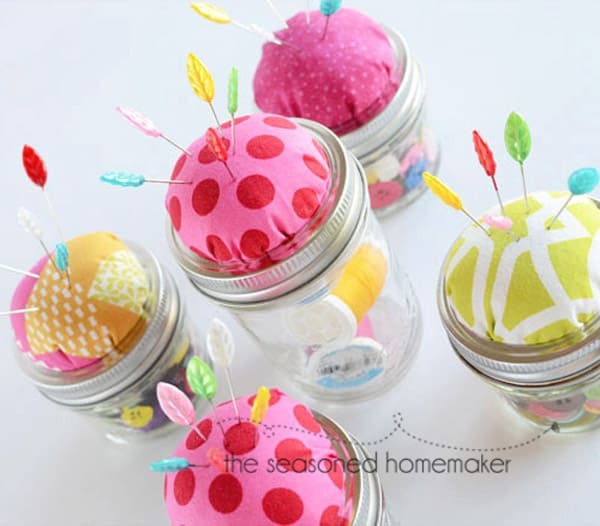 Easy to accomplish using button kits from the sewing store? These would be great to add as details on handmade hand decor such as pillows. A tutorial for attaching vintage doilies to a window frame for unique wall art. These lavender sachets are an ideal way to use the undamaged section when the rest of the linen has some irreparable damage. A tutorial for a pieced-together vintage table runner. Love these pretty dish towels with a bias tape edge. A tutorial for making vintage linens into cocktail napkins. Perfect when you’re feeling all quilt-y. A unique idea for using a small part of vintage linens to make a unique necklace, and it’s super simple. A detailed tutorial on making burp cloths with vintage linens. 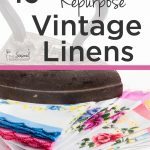 If you’re going to use vintage linens you will need to know to launder them. This shows some simple but good reminders. What a great post! I have a stash of vintage linens that will finally see the light of day. Thanks for the great ideas. These are some good ideas! I love them all, but the handkerchief valance, and the apron are my favorites. Thank you for the fun new ideas for old linens. I love finding uses for them. Pinned. Great ideas! I have some needle point dishtowels my grandmother did. I’ll have to get them out and use them in one of the ways you highlighted! Thanks for sharing. Here from The Shabby Nest. Hello Leslie, just want to let you know, that I love your blog and tutorials most. The photos are very clear and the text leads the way even for me, who only started recently again, after a break of 20 years. I am making tops and bags from African kikoy materials and you inspired me to get creative and also take up blogging again. Kind regards from a German in the African bush. Barbara, I believe I’m the one who’s been inspired by you! 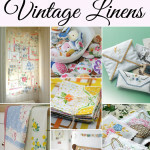 I would love to get my hands on some vintage linens. These projects are awesome. I would love for you to link up at the Stitch It, Blog It, Share It Link Party going on now at behindtheseamssewing.com. Great ideas for these linens! I especially like the sachet and buttons. I have seen dust ruffles made out of hankies as well….maybe adding a few to add interest will be a future project for me. Thank you for sharing. Also I checked out your burrito pillow case. It took me a while to digest it (hehehe) but after studying the pictures several times I got it. Thanks again! I saw this post through my pinterest feed and just had to read the article – love these ideas! 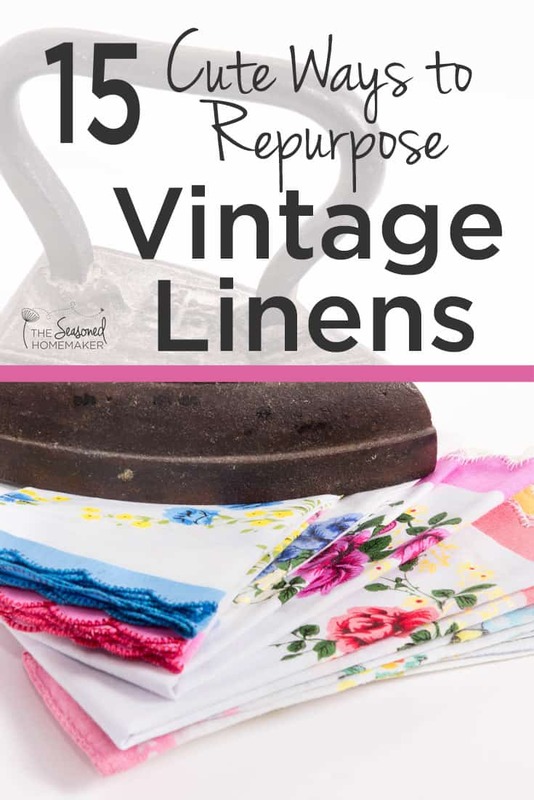 I don’t have vintage linens, but plan on perusing vintage stores just so I can try out some of these projects 🙂 I’ve pinned this post so I can reference it. Thanks for sharing these marvelous ideas! I am definitely going to be revisiting your site for my inspirations! 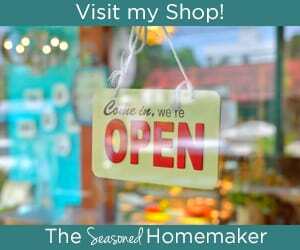 I have several vintage aprons that are in great shape. Their all different and I would love to use them with out risking ruining them. Any ideas? I’ll have to stew on that one for a while. Thank you so much for this info!I’m off to Goodwill in search of some hankies or napkins, my daughter needs a curtain or valance( or wall hanging) to make her dorm room more personal and interesting.thanks, again! These ideas are great! I made a cafe style curtain out of thrift store doilies when I needed more privacy without losing natural light. 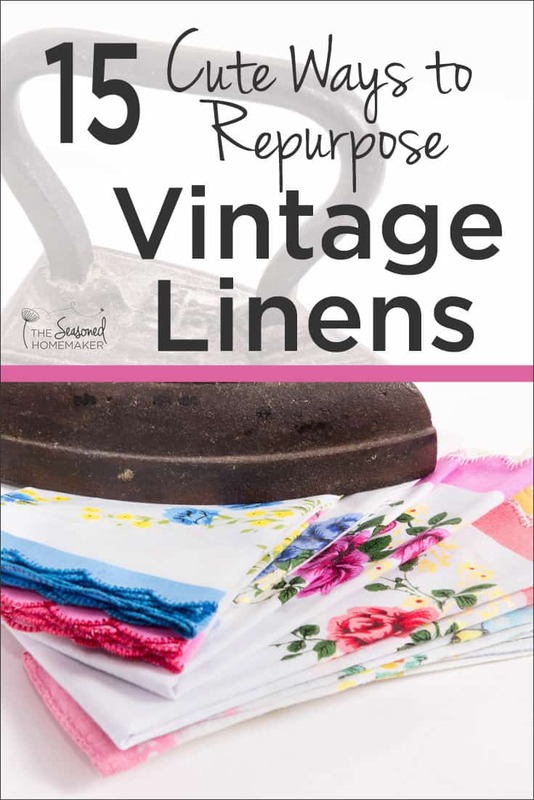 I find items like that and vintage linens at thrift stores – often with sewing and crafts items (even when finished) or stuffed in with sheets and curtains. Garage sales also be a great place. Sadly, great-grandmother’s handcrafted treasures may go for 25 cents each. Bravo for seeing the beauty that still is there! If it’s possible to be in love with a blog post, this would be the one for me. I’ve always been a collector (hoarder) of vintage linens. Thanks for all the great ideas. Much appreciation. What a beautiful post. I have a ton of old linens that I never appreciated until recently. This would be the perfect way to repurpose them. You might also like to look at the work of Cindy Needham and Kelly Cline that machine quilt old linens in the most amazing way. I too am from south central Texas and could use some of that rain we had in the spring. Thank you so much for you e-mails. The other thing I enjoy, my sewing, crafting, woodworking….e-mails. Thanks so much for your wonderful ideas. I always have LOTS of shabby linens that are too pretty to throw out. I love your vintage items. I make similar items. I call them Second Chances. I’m a cancer survivor, have His gift of salvation, and make old things into new items. It’s fun. Thank you for sharing such great ideas. How can i whiten ivory lace material! The lace is new i purchaced the wrong colour! I need to change it to brite white! Lovely ideas! Durability of linen fabric is endless, it can definitely live several lives. What cute ideas! I have my mom”s and my mother-in-law”s and made a decorative table cloth from them, but I have some left so glad I found your post. Of course, we do not use the table cloth for meals, it is only for decoration between meals.